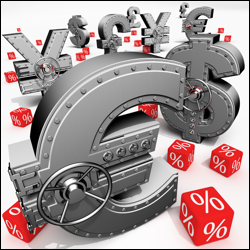 The European Central Bank (ECB) has today reduced its interest rates to fresh record-lows and launched a new scheme designed to increase the Eurozone cash flow. In addition to cutting its main refinancing rate by 0.1% to 0.05%, the central bank pushed its deposit rate even further into negative territory and will now charge those depositing funds overnight in Frankfurt 0.2%. Economic growth across the region was flat in the second quarter of the year and with the situation in Ukraine weighing on business confidence, the ECB has been required to take action. As well as cutting rates, the bank unveiled an asset-backed securities purchase scheme thought to amount to around €500 billion over the next three years; similar to the initiative introduced by the Federal Reserve as a precursor to quantitative easing. Speaking at the news conference following the announcement, President Mario Draghi said: 'The Governing Council sees the risks surrounding the economic outlook for the euro area on the downside. According to updated ECB forecasts, full-year gross domestic product growth will be just 0.9% this year, rising to 1.6% in 2015. Inflation is currently running at 0.3%, but the bank expects this to reach 0.6% before the year is out. Next year, it anticipates consumer prices will rise by 1.1%, still well below its target of just below 2%. Mr Draghi reiterates his sentiments that the ECB Governing Council is committed to using 'unconventional instruments' should inflation stay too low for too long. This phrase has been widely interpreted as a reference to quantitative easing. The President also revealed there had been some division among policymakers regarding the decisions announced today, though he insisted there was a 'comfortable majority' in support of the action taken.